Russia has been quietly building up its forces near the border with Ukraine since late summer and now has a military force greater than 2014, the year Moscow annexed Crimea, Viktor Muzhenko, the commander of Ukrainian armed forces, told Reuters in an interview last week. 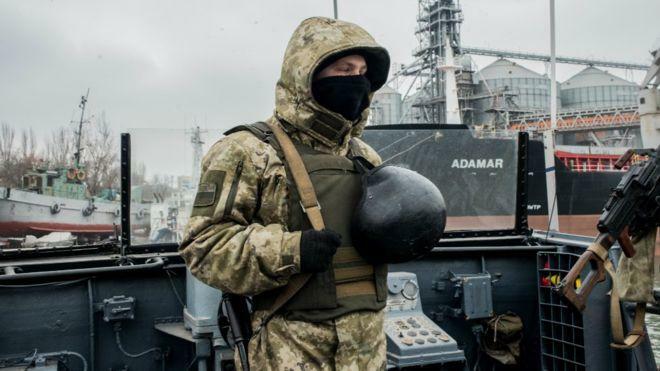 “This (the Kerch Strait incident) was an act of aggression from regular forces, the border service (of the Russian Federation) in relation to the Ukrainian armed forces,” Muzhenko added. Eric Zuesse via The Strategic Culture Foundation, made a great point in October that Washington is now treating Ukraine as if it were a NATO member, donating warships and military equipment to the country for use against Russia. This is the latest indication that America's military-industrial complex is shifting to Ukraine as the epicenter to start World War III, and from which the nuclear war is to be sparked against Russia. There is a reason why Russia is amassing hundreds of main battle tanks on the Ukranian border, that is because the next geopolitical flare-up is right around the corner, likely to occur during the next global recession. We are closer to war than the free range debt serfs of the US empire can imagine. A friend who learned to speak Russian while doing his medical training told me that the winter is when Russia likes to conduct military action because winter time in Russia is brutal; but the Russians KNOW HOW to fight in those conditions -- their enemies DON'T. The photo of the tanks was taken during this past summer, because if it were taken in October there would be snow on the ground. You can't just line up tanks and leave them like that indefinitely. You have to go out and start them up every so often. And their armament can't be let stand for long periods, either. Some of the shells and ammo has to be replaced. You have to add fuel to each one, and you have to perform routine maintenance, by lubrication and so on. Their tracks have to be operated, and turning the turret and raising and lowering the main barrel on each tank. When you DON'T keep the tanks running properly this way, if you suddenly run out there and try to get them all mobilized, many won't work. Espeicially RUSSIAN tanks, which are notorious for break-downs. The point is, it's a costly operation to have this many tanks in one place, far from home -- it would be a stupid waste of money. That is it would be stupid to have them lined up and maintained in a remote place unless they are going to be USED for some kind of action. The dark lines on the top side of each upper row are SHADOWS cast by the gun barrels. NOTICE -- there are no such shadows going downward from the lower rows. That's because the shadows of the tanks facing downward in the picture are falling on the tanks, not on the ground. You can see the actual tank barrels in the lower rows while the actual tank barrels in the upper rows are obscured by the shadows of the tanks on the ground. You can see that the vehicle moving to the right at the bottom is a cargo van because of the shape of its shadow. The sun is low in the sky, below this photo and to the left; could have been early morning or late evening. But even if it was mid-day, this is close to the Arctic Circle so the sun never gets too high in the sky.